Honda XR650R Big Red Pig. Collection only. These bikes now have a cult following and hard to find. Lovely genuine machine, lots of power and ready to go. A great opportunity to acquire a modern classic motorbike. Or you could do a full restoration and refit all lights etc. This bike has just been fully rebuilt from the ground up and needs nothing at all done to it to be competitive or ride ready. - New Air Filter. - VForce 3 Reed Block. - Silicone Rad Hoses. This bike does have its imperfections,, dings on thr exhaust and scratches around as not a new bike. Examine pictures. This is a very fast bike for 250cc. Hello, for sale is this 1994 Honda cr250. Rebuilt front caliper. Honda CRF 250R 2008 motocross bike with spare wheels. Wiseco high compression piston, Upgraded camshaft, DEP racing exhaust, Renthal twinwall bars, Lighter springs fitted to forks and shock. Standard springs included. New and unused air filter, front and rear pads, and footpegs. Stand and loading ramp also included. New engine & gearbox oil in bike with new oil filter. I have owned the bike since 2011 and I have not used it in years just don't have the time or the interest to do motocross anymore. 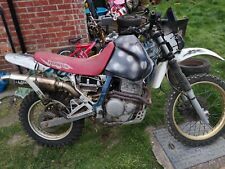 A great all around starter package for someone looking to get into motocross or hare and hound enduro. The bike has a full yoshimure exhaust system. (sounds amazing) the bike pulls really well threw all the gears. also had a oil change last month. And done around 10 hours in the last 12 months. The bike is a animal and not for the fainted hearted. I hope new owner will look after his bike as I did. 1989 Honda cr 250 evolution. Engine rebuilt using genuine Honda piston and gaskets/ all balls crank bearings and seals. Cash on collection. Bikes starts runs perfect and has been ridin for 15 max. Hundreds spent on NOS bolts and small pieces such as brake line guides etc. Here for sale is my stunning Honda CRF 250R EFI 4stroke 2010 its in great condition with a few up grades full S7 exhaust front to back, Excel rims laced to red anodised talon hubs, new graphics, new seat cover. Here is the 2019 CRF110F! 23 year old and still a real handful . this bike is ex irish supermoto machine now in mx spec and runs on avgas 50/50 with super unleaded with nothing but 747 oil. this bike has been within my circle of friends for 15 years and was in storage for 10 years. IDEAL 1ST INVESTMENT BIKE! DELIVERY AVAILABLE! BIKE HAS HAD VERY LITTLE USE. BIKE IS LOCATED IN NORTH-EAST SCOTLAND. HONDA CRF 110 2018 IN STOCK NOW KIDS MOTORCYCLE FINANCE AVAILABLE £1999 BARGAIN! Brand New 2019 Honda CRF250R - £149 Deposit - £149 a Month - 4 Year 0% Finance! 1985 cr 125 evo. Cash on collection. Bike is ready to ride. IDEAL INVESTMENT! BEST YEAR/SPEC! DELIVERY AVAILABLE! Completely original and unmodified. Big wheel version. Electric and kick start. 10-12 hours very low use. I bought this for my son to use in Garden and adjoining field, however he has grown to big for it. This bike has never been raced or abused. Cash or bank transfer on collection. This is my 2015 Honda CRF450. Full engine strip, new talon clutch basket, full engine leak down test, full suspension serviced, engine check and service £600 bill. Pro Carbon tank guard and skid plate. Honda CRF 250X, As you can see from the pictures this bike is In great condition with only minor use over the years. Just been serviced including new air filter, oil filter, sump plug and coolant. 0% FINANCE AVAILABLE,PX WELCOME,NATIONWIDE DELIVERY. This is a great stylish motorbike - an original Deus Ex Machina. This is one of the earlier models - a Honda Tiger - 200cc and made in Bali - it still has the original number plate. Honda cr 80 AIR COOLED this has been sitting in my garage doing nothing hadnt started it for three months it started on the second kick the choke has stopped staying on when pulled up it disnt affect it running. Honda CRF250 2011 EFI. Huge Spec Race Bike With Fresh Engine Rebuild. Just Had New Wiseco Piston, Crank, Rod Kit & Bearings. The Bike Is An Ex Race Bike That’s Got The Following:-. EvoTech Race Suspension Setup For 13.5 Stone Rider.